Last week my Thursday class focused on using primary sources, interpreting documents and analyzing art and photographs. 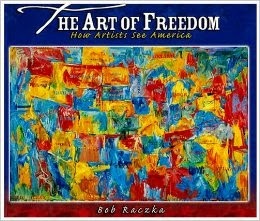 We also looked at the book THE ART OF FREEDOM: HOW ARTISTS SEE AMERICA, by Bob Raczka. Using very simple text and art from the likes of Georgia O'Keefe, Thomas Hart Benton, John Trumbull, Stuart Davis, and more, Raczka provides an introduction to the things that make us American. In pictures and words America is depicted as hard work, jazz, baseball, freedom, and more. This book got me thinking about the stretch this week. Since the 4th of July is Friday, this seems like a perfect time to write about what America is. I hope you will join me in writing about America this week. Please share a link to your poem or the poem itself in the comments. At the end of each week I head to church to practice the music I'll be singing on the weekend. I could probably lead most of these songs in my sleep, but I feel better about croaking out songs at 8:30 on Sunday morning when I've had a bit of rehearsal. This time of year my favorite thing about visiting the church is Father George's garden. Right now it is filled with gorgeous wildflowers. Seeing them today reminded me of this poem. of them, all beginning with the letter b.
of their hues and shapes, their breeding. I do hope you'll take some time to check out all the wonderful poetic things being shared and collected today by Buffy Silverman at Buffy's Blog. Happy poetry Friday friends. Over the weekend I was reading excerpts from the essays of Alfred Brendel on music and came across a notion that has stuck with me. "The word 'listen' contains the same letters as the word 'silent'." It seems so obvious and simple really, but silence is so important. The silence in music often conveys as much as the notes. It is in the silence that I do my best thinking, best writing, and best observing. I also can't help but think this is important to convey in the classroom as I teach kids how to speak with others and to actively listen. So, silence seems like a good topic for writing this week. I hope you will join me in writing about quiet this week. Please share a link to your poem or the poem itself in the comments. Late again, I am. I spent the day yesterday cleaning house with my son. It's an end of the school year tradition. He goes through his books, "toys" (he's 13 now, so apparently I can't call them toys any longer) and other materials he's collected over the course of the year and offers them up for donation. A large box of books is going to teacher friends, the rest have gone to Freecycle. I've done a lot of cleaning out over the last year, first as we downsized my mother to a 190 square foot room in a nursing home, and just recently as we've downsized my in-laws from a 3000+ square foot home to a retirement cottage of just over 1400 square feet. All this downsizing has made me realize how much "stuff" I have that I don't need. As hard as it is to let go of things, this "stuff" does not make my life. There is much I can and will gladly give away, but the collections? Now this is where I have difficulty. I have a hefty stamp collection, but I have taken it to my office and now use it in my teaching. I have been collecting teapots (individual sizes) since my college days. I use one or two, but the rest sit on a shelf where I love to look at them. I have a large collection of of pottery I use in the kitchen. Most of these dishes only see the light of day a few times a year, but again, I have glass-front cabinets and love to see them. My largest collection of items is books, and books I just can't bear to part with. Do you have a collection? If it could talk, what would it say? What would you say about it? Let's write about collections this week. I hope you will join us. Please share a link to your poem or the poem itself in the comments. Back in April, Travis over at 100 Scope Notes sponsored a gallery of book spine poems. He's been doing this since 2010, so if you check out this year's gallery, you can also explore poems from other years. Book spine poems are the equivalent of visual centos. You take someone else's words and arrange them to make something new. This morning while re-shelving books from last week's classes, a few titles jumped out at me. I suppose you could say my books goaded me into the stretch this week. Here are my poems. one leaf rides the wind. With the exception of A MILLION DOTS, all of these are poetry books. I hope you'll join me in perusing your shelves and creating a book spine poem this week. I don't think you can leave a photo in the comments, so please share a link to your poem. In introducing my Poetry Friday post on Sorrow, Diane Mayr wrote "Tricia at The Miss Rumphius Effect is back. She's been having a difficult month and so, she's posting a poem called "Sorrow." Since a shared sorrow is a sorrow halved, then by the end of the day, her readers should have her back on the joy track." Many of you dropped by to offer offer words of wisdom, virtual hugs, and kind thoughts. Diane wrote "Embrace the sadness for without it, you can't appreciate the happy times." Tanita left me this lovely poem. Mary Lee reminded me why I love Poetry Friday and the Kidlitosphere so much when she wrote "I am thankful to be part of a community where you could lay it before us (along with a poem) and allow us to gather round you, hold you up, help you move on." Margaret Simon wrote "Sorrow is like a ceaseless rain, but when it is through, the sun shines and the flowers bloom and we see life anew. That is my hope for you." Laura wrote "We all have seasons of loss—times of year when anniversaries and birthdays of those we've lost make us sad. Millay's poem captures that slowed-down feeling that comes with grief. Sending you a virtual hug. There were many more lovely messages shared through e-mail, Facebook, and Twitter. Your support has broken through the clouds and allowed the sun to shine through. I can't thank you enough for that. The next time I need some cheering up, I will return to this post to soak up the kindness. As my mother would say, I'm a day late and a dollar short, but at least I'm here. This in one of my favorite May Swenson poems, second only to Analysis of Baseball. be a funnel, or Hello. 1 A grass blade or cut. 3 Shallow mitten for a two-fingered hand. Visit Joyce Sidman's site to see how she used the words in her name to write an ideogram poem. Now it's your turn to write an ideogram poem. Won't you join us? Please share a link to your poem or the poem itself in the comments.